Our Firm | Wold Johnson, P.C. 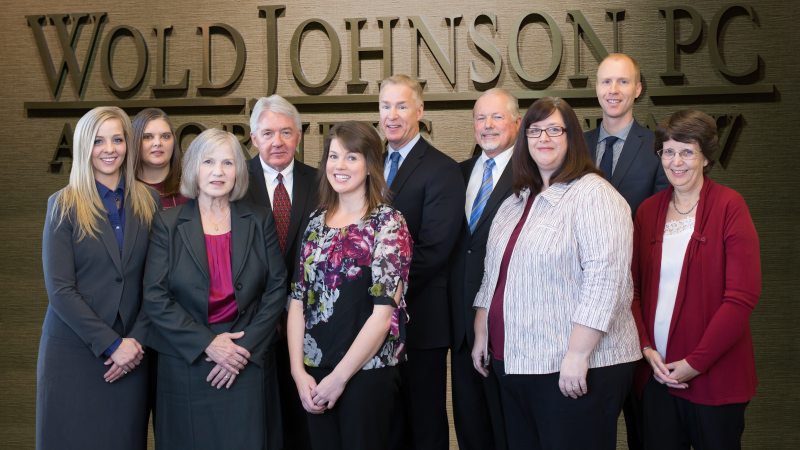 Wold Johnson, P.C., has a long history in the Fargo-Moorhead area. The firm was established in 1916 when A.R. Bergesen graduated from Northwestern University at Evanston, Illinois, and moved to Fargo, North Dakota, to establish a law practice. “Berge,” as he was known to his many friends, set up a law office on Broadway and went on to become Cass County State’s Attorney, State Representative, and Speaker of the North Dakota House of Representatives. Together with his partner, Otto Haakenstad, he founded Western States Life Insurance Company, which developed into one of the state's largest insurance companies. At the age of 64, "Berge" left the practice of law to become President of Gate City Federal Savings and Loan Association and presided over its state-wide expansion. 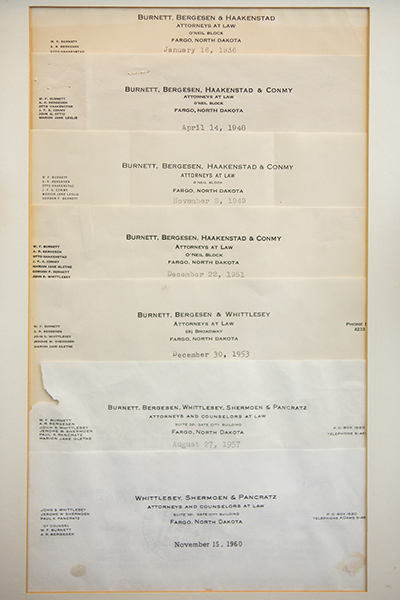 As the historical letterhead frame depicts, this law firm has operated under a variety of names as its membership changed over the years — "Burnett, Bergesen and Haakenstad," "Whittlesey and Pancratz," "Pancratz, Wold and Johnson," "Wold Johnson, Feder, Brothers, Beauchene and Schimmelpfennig," and most recently, "Wold Johnson, P.C." What has remained constant is the firm’s dedication to excellence and commitment to serving the community. For over a century, members of the firm have taken pride in playing active roles in the development of the Fargo-Moorhead area. Members’ contributions include service as a Justice on the North Dakota Supreme Court, President of the State Bar Association of North Dakota, President of the North Dakota Bar Foundation, member of the North Dakota Legislature, member of the Board of Directors of the Fargo Chamber of Commerce, State Bar Delegate to the American Bar Association House of Delegates, and Fellow of the American Bar Foundation, as well as numerous committees in the community. These contributions have had a lasting impact on the legal profession, as well as the Fargo-Moorhead community as a whole. Throughout its recent history, the firm has maintained the highest rating for legal and ethical standards (AV) - Martindale Hubbell Law Directory. Its five lawyers presently reflect a combined 120 years of practice experience and are honored to carry on the tradition of hard work and integrity begun more than a century ago.